“The title is simple. The talent is spectacular.” – that’s what the blurb on the volume’s back cover says. Someone couldn’t have come up with a more apt description of the book. 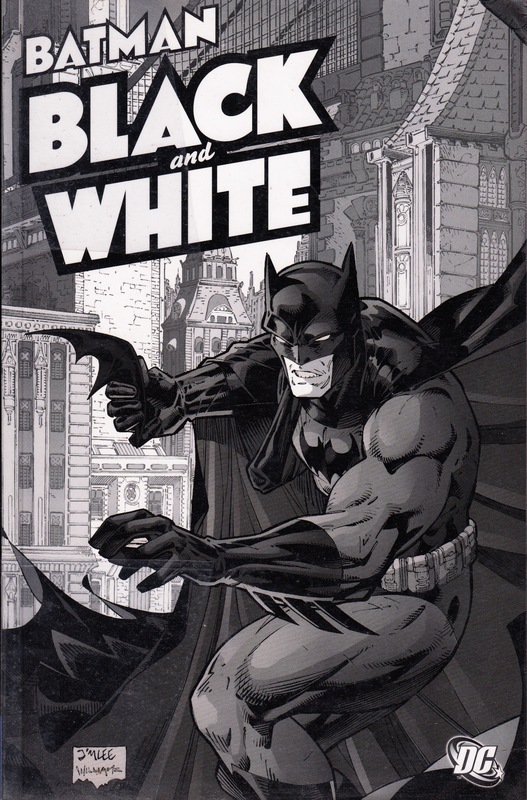 Batman Black & White (now retrofitted with a ‘Volume 1’ tag along its spine) is an anthology. It contains many short stories that are 6-10 pages long. In the foreword of the collected edition, Mark Chiarello, one of the editors of the series, recollects how apprehensive he was about pitching an anthology in Black & White. Luckily he got Scott Peterson on board and approached the project with a singular mindset – to get the best writers and artists. As a reviewer, who got hold of this book 20 years after it was originally published, I can only take the information Chiarello has presented in the book. The anthology collects the original four single issues. The only colour image is on the back cover. Through the 20 short stories, we are not only exposed to the myth of Batman but also a writer or an artist’s interpretation of the myth. Not all of the writers belong to the fraternity of superhero comics. Some of them are indie comic book artists; and one is a famous mangaka. There are interesting takes of Batman. In the opening story, Perpetual Mourning, the narration is replaced by Batman’s thought process, while he is busy doing the job of a detective in a morgue. This is a very traditional take on Batman – something that has been abandoned in favour of action and psychological profiling of the hero in the more recent stories. Joe Cubert does the same with his story, The Hunt. In this short, Batman plays the role of a traditional detective, trying to hunt down a serial killer. 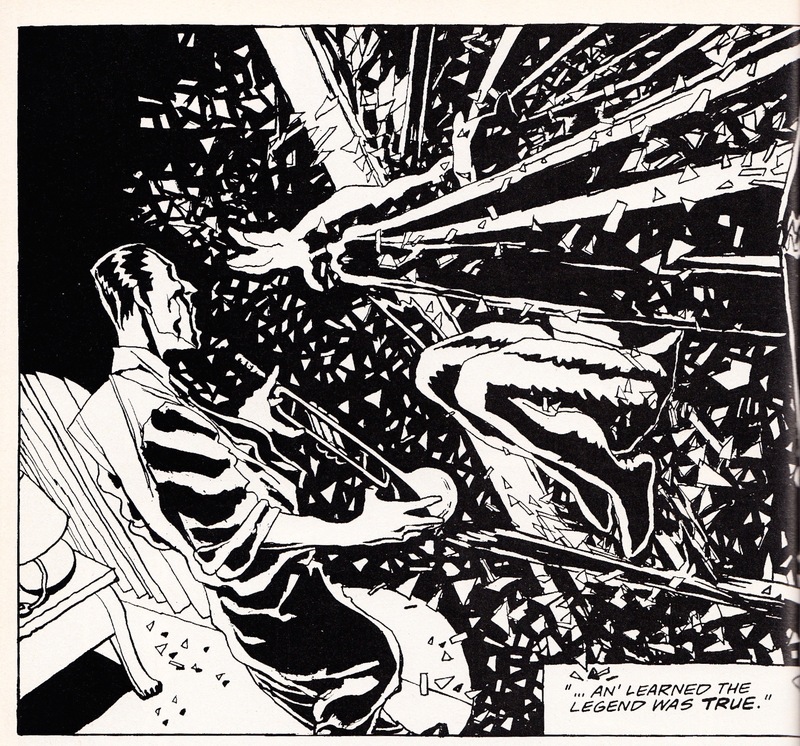 There are a few stories where Batman or his shadow features only in a panel or two – thereby reinforcing the mythical nature of this superhero. One of the most memorable shorts utilising this mythical nature is The Devil’s Trumpet by Archie Goodwin. …and executes it. 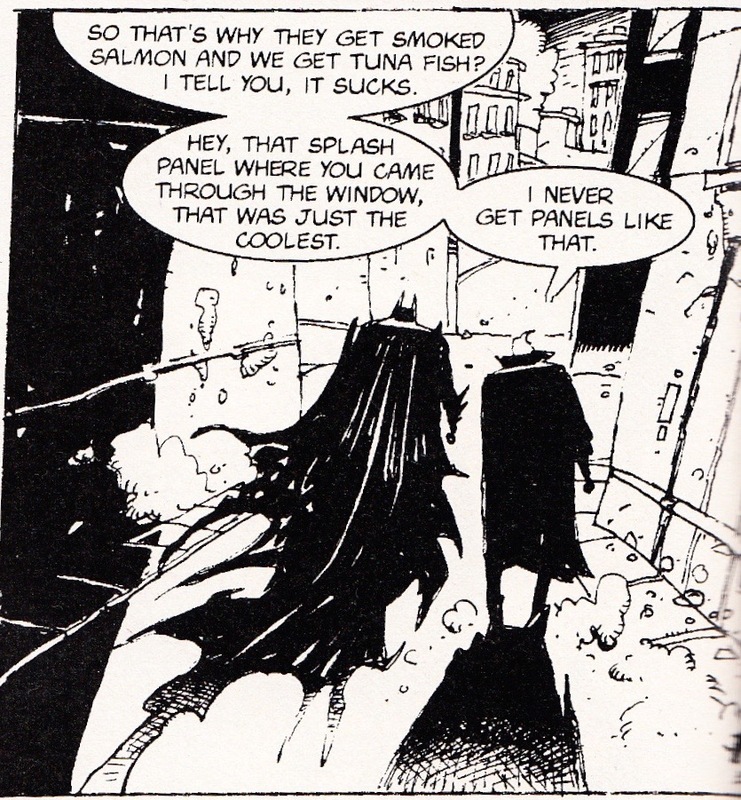 This is the only panel in the entire story to feature Batman. 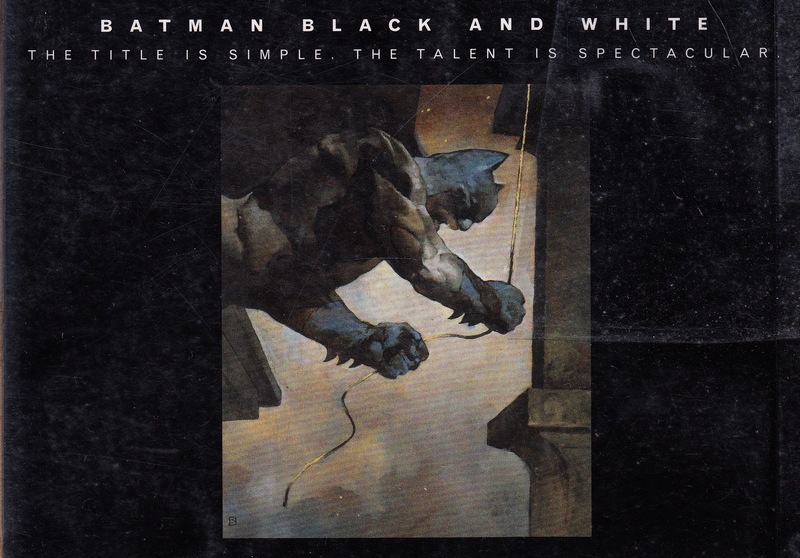 The most interesting take was the story, A Black and White World, by Neil Gaiman. He sets up the narration as if Batman and Joker are practicing for their appearance in a comic book spread, just like a theatrical rehearsal. After the panels are laid out, they have an idle banter about how the artist had depicted them as characters. It was very meta. Neil Gaiman uses a clever meta framing. Here we see Batman getting an awesome panel. It is followed by this banal discussion between Batman and Joker. Joker complains that the artists never give him such panels. The artwork is worth the price of admission alone. 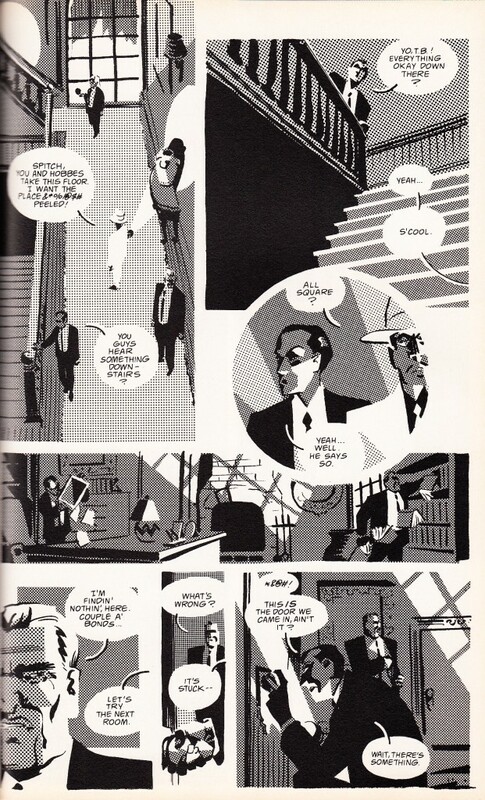 There are stalwarts like Bruce Timm, Klaus Janson, Brian Bolland and Brian Stelfreeze, whose art styles are so unique that I could have recognised them from afar. I was surprised to see Katsuhiro Otomo getting featured. Those who have read Akira will immediately recognise his detailed backgrounds and ruins. 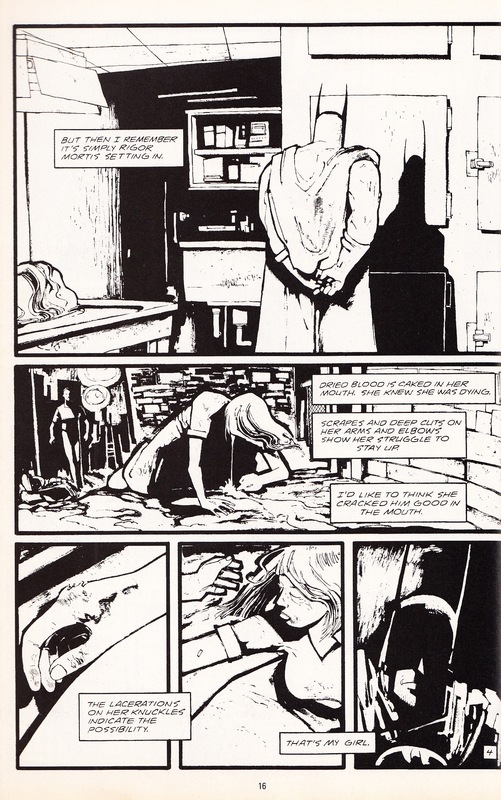 I am not a big fan of dirty, sketchy lines, which is why I did not like the shorts by Kent Williams, Teddy Kristiansen or Bill Sienkiewicz. There are artists, about whom I had never heard of before. To put it more correctly, I had never come across their works earlier. Ted McKeever is one of them. Matt Wagner is another. In the absence of colour, they use techniques like negative painting and half-tones to create unique visuals. 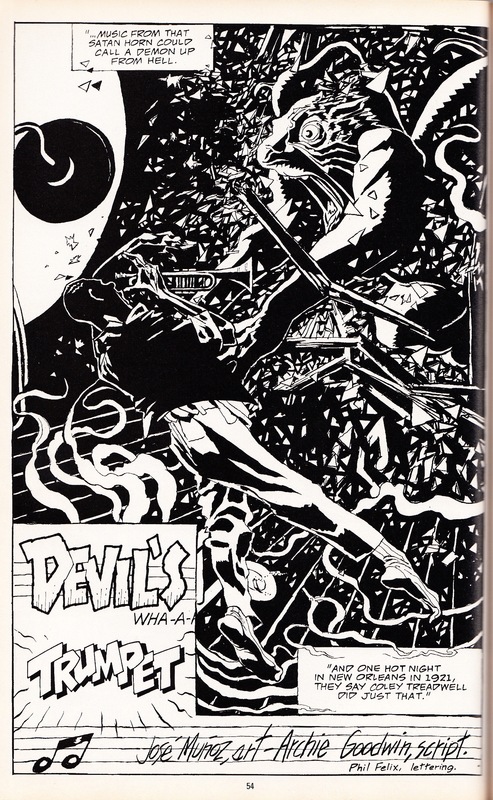 Ted McKeever paints the white areas on black canvas / sheet to give that jagged feel to the edges. Should I get a copy? If you are new to American comics, you should wait until you have read some substantial indie stuff. 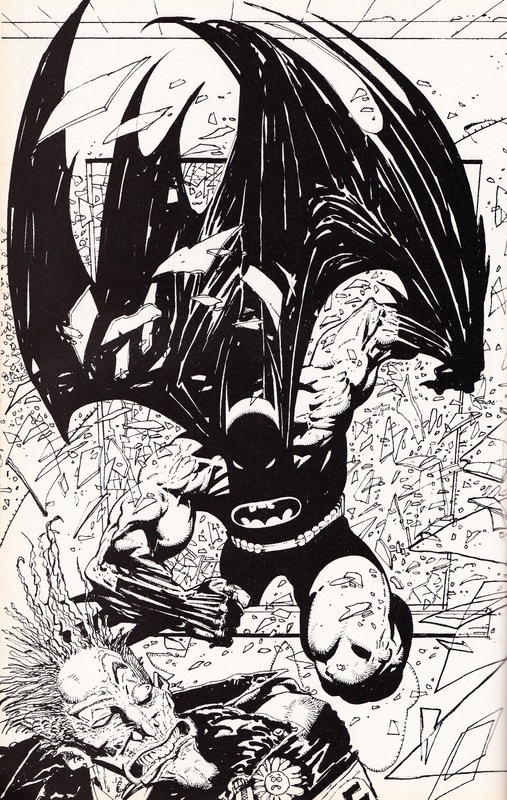 If you are just getting into Batman, you should wait; unless you have read a lot of indie and experimental works. In the latter case, this collection would be a perfect entry point to the mainstream story arcs. If you are a big Batman fan, chances are you already have it in your collection. Many reviewers mark this anthology as a “must own” for any Batman fan. I disagree. It has its own novelty but in no way is this collection any representative of the great Batman story arcs. It’s a good collection but not one that belongs with the other Batman collections.